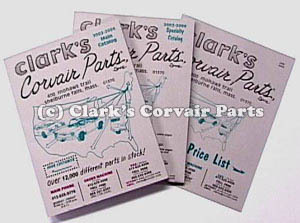 Clark's Corvair Parts - Clark's Corvair - Clark's Corvair Parts, Inc.
PARTS? - gaskets & seals, engine, transmission, suspension, trim, emblems, fasteners, upholstery, carpets, convertible tops, weatherstrips, shop manuals, books, sheetmetal, VW conversions, performance, & over 1100 sketches, over 500 exploded diagrams, & over 1900 photos & info on the Corvair Society of America. THE 3 CATALOG SET IS OVER 3 LB! Credit Cards or Checks, No personal checks. Foreign Checks must be Money Orders or 'Bank Checks', payable in U.S. dollars through a U.S. bank. See Clark's Corvair Catalog. You can also order a catalog with a parts order from our online catalog.